In my previous post I outlined the preparations for the new Illuminations/Royal Shakespeare Company film of Julius Caesar for BBC Television. Over the next three weeks or so, as we are filming on location, I intend to write about the earlier British television versions of Shakespeare’s play – and to review each of the extant ones. This post looks briefly at the first full-length production, which was staged in modern dress by producer Dallas Bower in the summer of 1938. But with the assistance of the BUFVC’s invaluable Shakespeare: An International Database of Shakespeare on Film, Television and Radio I also sketch the chronology of the play’s appearance on British television from 1937 onwards. Just three months after the official BBC Television service from Alexandra Palace started in early November 1936, Scenes from Shakespeare featured the film actor Henry Oscar giving Mark Antony’s funeral ovation. The ten-minute programme was shown at 3pm on 11 February 1937. 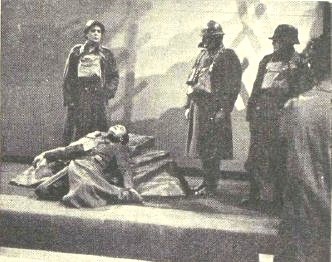 Six weeks or so later, the same series offered a 15-minute extract (which is unidentified) of the play with Cassius (Robert Holmes), Brutus (Malcolm Keen) and Portia (Mary Hinton). No recording, of course, exists today, and nor does any audio-visual trace remain of any of the productions before 1959. The Old Vic was in its third year of a five-year project to stage all Shakespeare’s plays working from the First Folio. There are shots of dress rehearsals, scenery and lighting for a production of Julius Caesar. Huw Wheldon talks to the Company Director, Michael Benthall about the production. The programme then moves to Lime Grove studios where the actors enact scenes from the same production for television which is broadcast immediately afterwards. The actors in the enactments were John Neville (Mark Antony), Richard Wordsworth (Cassius) and Paul Rogers (Brutus). Julius Caesar, 8-29 November 1960, four 30-minute episodes. Produced by Ronald Eyre for Schools television, with James Maxwell as Mark Antony and Ralph Michael as Caesar. The Spread of the Eagle – a nine-part adaptation in 50-minute episodes of Shakespeare’s Roman plays by producer Peter Dews, with Julius Caesar occupying the middle three parts: The Colossus, 24 May 1963; The Fifteenth, 31 May 1963; and The Revenge, 7 June 1963. Julius Caesar, 23 April 1964, 80 minutes. A televised recording of Michael Croft’s modern dress production with the National Youth Theatre at the Ashcroft Theatre, Croydon. Play of the Month: Julius Caesar, 13 April 1969, 120 minutes. Alan Bridges directs and Cedric Messina produces this recording with Maurice Denham as Caesar and Robert Stephens as Mark Antony; Edward Woodward is Cassius. The BBC Television Shakespeare: Julius Caesar, 26 July 1978, 170 minutes (!). Messina is the producer again, with Herbert Wise directing. With Charles Gray (Caesar), Keith Michell (Mark Antony), Alexander Davion (Cassius) and David Collings (Brutus). So even if we leave Heil Caesar to one side, that is eight previous productions of the more-or-less full play by BBC Television. This must surely make it the most popular of Shakespeare’s plays on British television. The ever-reliable Michael Brooke at BFI Screenonline has further details in his ‘Julius Caesar on Screen’, to which we will also return in the coming posts. In television’s first three years the producer Dallas Bower mounted a range of fascinating studio productions that tested the limits of the medium and challenged its modest audiences with rigorously intellectual fare. (My article ‘Dallas Bower: a producer for television’s early years, 1936-39’ about Bower’s work has recently been published in Journal of British Cinema and Television 9.1.) He was committed both to experimenting with what television might achieve and to the masterpieces of the European high art tradition. In 1937, working with minimal resources, he mounted Katherine and Petruchio, David Garrick’s eighteenth century version of The Taming of the Shrew, and following on from Julius Caesar he produced the outside broadcast of Michel St Denis’ Twelfth Night and a studio version of The Tempest, both of which starred Peggy Ashcroft. His other offerings included a masque version of Act II of Wagner’s Tristan and Isolde and a staging of Pirandello’s Henry IV. Clearly she had not been to the Festival Theatre Cambridge.